Reminder. The next RYDE ROWING CLUB Fish & Chip Suppers and Talks takes place on THURSDAY, 25th APRIL. The third FISH & CHIP SUPPER AND TALK of the new season takes place on THURSDAY, 25th APRIL AT 7.30PM at the Clubhouse. The talk is by – Stuart Bennett – Flores, Island hopping, diving and a visit to see the Komodo dragons. ALSO – MONTHLY “150 CLUB” CASH DRAW AND RAFFLE. All Club & 150 Club Members plus family and friends welcome. ALL FOOD ORDERS TO STEPH HICKMAN PLEASE, BY MONDAY 25th March at the LATEST. NB. WE CANNOT GUARANTEE MEALS IF ORDERS ARE PLACED AFTER THE DEADLINE. Fish & Chips Suppers and talks will continue – usually on the last Thursday of the month - until November when there will be a break over the Christmas and New Year period. IW Regatta Weekend. Camping at Ryde and Sunday Morning Breakfasts. After protracted negotiations, certain assurances on our behalf and payment of additional fees I am pleased to be able to advise visiting Clubs that our local authority, the Isle of Wight Council has agreed, once again, to allow the camping in Appley Park, next to the Ryde R. C. Clubhouse to continue. However additional restrictions and conditions have been imposed that the Club and its visitors must comply with or risk being prevented from camping at future Regatta’s. No one will be allowed to Camp in the Park overnight on the day before the Regatta – the night of Friday 17th May. Subject to numbers involved the Club will allow members of visiting clubs to sleep in the Clubhouse overnight on the 17th May. 1) Clubs must notify Ryde R. C. of their intention to camp overnight on the 18th with approximate numbers by the 15th May. 2) Camping will only be allowed in the designated area by the Ryde R. C. Clubhouse and must not spread into the park as it has in the past. 3) No Tents can be erected until 4.00pm on Saturday, 18th May – and all must be taken down by 9.00pm on Sunday, 19th May. 4) No BBQ’s are allowed in the camping area. The facilities of the Ryde R. C. Clubhouse will be made available to the members of visiting Clubs who are camping. Please advise Ryde R. C. by 30th May at the latest if you intend to make use of this opportunity at the reply to address above or by E Mail to – stephencbull@googlemail.com or by calling 01983 566481 or 07786 034941. RYDE REGATTA BREAKFASTS - 2019. As in past years Ryde Rowing Club are offering a full English Breakfast for those who are interested on the day after Ryde Regatta (the day of Shanklin Regatta) - SUNDAY, 19th MAY, 2019 - served in the Ryde R. C. Clubhouse, Appley Park, Ryde. On SATURDAY, 18th MAY - a BBQ Breakfast will be available in the Clubhouse from around 8.00am - without the need to book in advance. Breakfast will be served from around 7.30am, subject to the start time of Shanklin Regatta. If breakfasts are to be served earlier Clubs will be advised of the time when the tickets are sent out. *A limited number of breakfasts will probably be available for purchase on the day - but these will cost £4.00 each. Could Clubs please forward names and money, at £3.00 per breakfast to the "reply to" address to be received not later than Wednesday, 15th May. Receipts will be forwarded for exchange for the breakfast or handed over on the day. Please note if you are unable to present your ticket we reserve the right to refuse to serve you or charge the purchased on the day rate of £4.00 a positive response from at least ten people – (that is ten in total - not from each Club) will be required to justify these catering arrangements. Payment can be made by electronic transfer to: Account number – 36292176. Sort Code – 07-01-16. Please put Club name in reference field and send E Mail to josiembull@googlemail.com to confirm method of payment. The next RYDE ROWING CLUB Fish & Chip Suppers and Talks takes place on THURSDAY, 25th APRIL. Thursday 30th May – Dr Ruth Waller – Pig Leg Lane. Thursday 27th June – Margaret Jessup – Debtors All – (Ships, Debts and a Duel in Cowes). Thursday 25th July – Tim Adams – Debtors All – “Yacht Recovery of the beaten track & Piracy off the Gulf of Aden” . Thursday 22nd August – Felicity Radak – “the Isle of Wight Youth Trust”. Note: One week earlier due to Ryde Carnival. Thursday 26th September – Martin Woodward – “Treasures from the deep”. The Clubs Annual Regatta is on Saturday, 18th May - with Shanklin on Sunday, 19th. It will be a busy weekend for the Club and Members are asked to come and help as much as they can. Friday (17th May) to help Setup. The Sandwich bash will be early evening on this Friday. with serving of Refreshments, during the day and into the evening at the Clubhouse. In particular we need some help manning the Ryde R. C. Safety boat (preferably but not necessarily with some experience. Help with Breakfasts on Sunday morning – if we have any? Sunday and Monday - help to clear up the mess & get the Clubhouse straight. Regatta Set Up/Clear up - Steve Bull. Please let us know what you can do to help. With my thanks in anticipation. Ryde R. C. Regatta Weekend Saturday/Sunday, 18th/19th MAY, 2019. HELP REQUIRED! Ryde R. C. Regatta Weekend. Saturday/Sunday, 18th/19th MAY, 2019. & get the Clubhouse straight. Southampton Coastal Head of the River Race. Saturday, 6th April, 2019. Ryde Rowing Club competed in their second event of the season on Saturday – the Southampton Rowing Club Coastal Head of the River raced over two divisions over a three and a half mile course on the River Itchen in Southampton. In the first division the Clubs Coastal Junior Four of Tom Starkey, Ben Sanderson, Tye Cameron and Austin Smith with Dan Sanderson coxing produced a good performance although they would have been a little disappointed with their 7th place finish in a strong field. In the 2nd division a young Ladies Novice Four of Poppy Starkey, Freya Drage, Jasmine Corney and Emily Davis and once again coxed by Dan Sanderson in only their 2nd race produced an excellent performance against much older opposition, finishing in 4th place - although a minor course infringement cost them a fifteen second time penalty that cost them a place. Reminder. RRC Quiz Night and the University Boat Race. A reminder - the Club is staging a quiz night this Friday - 5th April. 7.30pm to 11.00pm in the main Club Room. Entry fee £4 per team - with a cash prize. Also on Sunday, 7th April - the Bar will be open from 12 midday - so you can enjoy a drink while watching the university boat races. The Women's Boat race takes place at 2.13pm - the Men's Boat Race at 3.10pm. Reminder. Pre-Season Rowers Meeting and Social is this Friday, 29th March, 2019. at 7.30pm in the Main Lounge of the Ryde R. Clubhouse. A reminder the Pre-Season Rowers Meeting and Social is this Friday, 29th March, 2019. at 7.30pm in the Main Lounge of the Ryde R. Clubhouse. All those intending to compete this season + parents/guardians of Juniors should try their best to attend. Fixtures/Fees/Transport/Kit/Training/Safety/South Coast Rowing Championships/Contacts/Club Regatta/Availability/Welfare/ Equipment//Sponsorship/Fund Raising/Social Events etc.. This will be a good opportunity to buy or order Club Branded kit which will be available to view. Chillie & Crusty Bread will be available (small charge). BTC Rowing Club Coastal and River Head of the River Race. Saturday, 23rd March, 2019. Ryde Rowing Club competed in their first event of the season on Saturday – the BTC Rowing Clubs Coastal and River Head of the River Race. The Wightlink sponsored Club had a young and relatively inexperienced team afloat several making their racing debuts for the Club - but produced an encouraging set of results. The event was raced over two divisions over a three and a half mile course on the River Itchen, Southampton raced in reasonably good conditions. The newly formed Men’s Novice Four of Paddy Kearney, Jonah Lewin, Charlie Walford and Gulliver Roghan coxed by Dan Sanderson competed in the first division in a river four finishing in 2nd place. Also racing in division one was Harry Jones in his first race as a Coastal Novice sculler and did well to finish in 3rd place in his event. In the 2nd division a very young Girls Four of Poppy Starkey, Freya Drage, Niamh Edwards and Emily Davis and once again coxed by Dan Sanderson competed in the Girls J16 Coxed Quad – racing above their age group – and did exceptionally well to finish in 2nd place. The Clubs Coastal Junior Four had made the decision to race in small boats as they completed their winter training cycle – with Tom Starkey and Ben Sanderson racing in the open men’s double where some steering difficulties led to a 4th place finish. Austin Smith and Tye Cameron raced in the Men’s Novice Sculls in River boats with Austin finishing 2nd and Tye 3rd. A Reminder - The second FISH & CHIP SUPPER AND TALK of the new season takes place this THURSDAY, 28th MARCH AT 7.30PM at the Clubhouse. The talk is by – Mike Brooke- ‘Three Fighters from Three Wars’ and what they were like to fly. Also on Friday, 5th April join us for - a Quiz Night - more information to follow - watch out for further E Mails! The second FISH & CHIP SUPPER AND TALK of the new season takes place on THURSDAY, 28th MARCH AT 7.30PM at the Clubhouse. Thursday 25th April – Stuart Bennett – Flores, Island hopping, diving and a visit to see the Komodo dragons. Pre Season Rowers Meeting & Social. Friday, 29th March, 2019. 7.30pm. Pre-Season Rowers Meeting and Social. Main Lounge – Ryde R. C.
All those intending to compete this season + parents/guardians of Juniors should do their best to attend. Reminder. Games Night at the Clubhouse. Tomorrow - Friday, 8th March, 2018 at from 8.00pm. A reminder that the Club is staging a Games/Bar sports evening at the Clubhouse - this Friday - 8th March, 2019. All members welcome - and bring your family and friend. Poole. Shove ha'penny, Skittles, Cube games, Horse Race + others. THURSDAY 28th February AT 7.30PM at the Clubhouse. ALL FOOD ORDERS TO STEPH HICKMAN PLEASE, BY MONDAY 25th February at the LATEST. A quick reminder - your Committee is planning a bit of a work day - or at least a work morning - at the main Clubhouse at Appley this Sunday, 24th February - from around 9.30am - to undertake one or two Clubhouse refurbishment/repair/decoration tasks that we need to complete - plus a clear-out of the loft. If any or you are available to lend a hand for a few hours it would be greatly appreciated. Just come along to the Clubhouse at around 9.30. With our thanks in anticipation. They're back! The RYDE ROWING CLUB Fish & Chip Suppers and Talks. takes place on THURSDAY 28th February AT 7.30PM at the Clubhouse. Thursday 28th March – Mike Brooke- ‘Three Fighters from Three Wars’ and what they were like to fly. Also on Friday, 8th March join us for - a Bar Sports Night and on Friday the 5th April - we are having a quiz night - more information on both to follow - watch out for further E Mails! Ryde Rowing Club Annual Subscriptions are now overdue - and a reminder - the DISCOUNTED RATE ENDS 1st MARCH, 2019. Can we thank all the Club Members who have renewed their Annual Subscriptions to date - your early payment helps the Club and saves you money – and saves us having to chase-you up! Please help the Club and yourself and pay promptly. We are pleased to be able to say that there has been no increase in our rates of subscription this year - it should be noted that, on average, if paid at the reduced rate – our rates of subscription remain the same or less than any other Island Rowing Club – and membership fees – at all levels – at mainland clubs are significantly higher. The Associate membership – at just £20 – where the only restrictions are on the use of the Clubs boats and training equipment are an ideal level of membership for parents wanting to support their sons and daughters who row. Membership type Payable before 1st March, 2019/Payable after 1st March, 2019. Note: For new members, who have joined since October, 2018 the membership already paid covers the current subscription year. Your next subscription will be due, subject to approval at the 2019 AGM on 1st January, 2020. Subscriptions should be paid as soon as possible – over the bar at the Clubhouse or sent to the membership Secretary, Steph Hickman at 145 Great Preston Road, Ryde, Isle of Wight. PO33 1AZ. Telephone number 01983 613077. E Mail: steph.hickman1944@gmail.com Cheques should be made payable to "Ryde Rowing Club". You can also pay by electronic bank transfer - please transfer the appropriate subscription to Account Number - 03707210. Sort Code: 20-60-55 and put RRC Membership in the reference field - and it would also be helpful if you could E Mail Steph Hickman if you choose to pay this way - advising her that you have done so. Standing order forms are also available on request and are available at the Clubhouse - although the opportunity to set-up a monthly payment has now passed - although this can still be set-up by special arrangement - but would require a cash/cheque payment to cover the January instalment. Steve Bull. For RRC Main committee. The Club is delighted to announce that Wightlink, Isle of Wight Ferries have confirmed that they will continue their sponsorship of the Club in 2019. They provide the Club with considerable assistance in transporting their competitors, coaches and equipment to and from the Island for mainland competition throughout the year. Their support allows the Club to compete on the mainland on a regular basis in the Hants & Dorset ARA Coastal Regatta Programme during the summer months and inland in River events during the winter. Their support has been especially helpful to the Clubs successful and expanding Junior Section enabling them to attend competitions and training camps on the mainland. Without Wightlink’s support all these activities would be substantially restricted. Presentation to IW Youth Trust & Donation to Club from Churchers Solicitors. Sponsors, supporters and helpers of Ryde Rowing Club were entertained at an informal gathering at their Clubhouse on Friday evening (25th January) to thank them for their support during the last year. The Club President - Peter Allsopp welcomed and thanked all those in attendance and offered a special thanks to the Clubs main sponsors Wightlink and to the main Regatta Sponsor TLM Laser. The Club Captain Graham Reeve then talked briefly about the Clubs activities and success in 2018 which was followed by a short audio visual presentation. Senior Club coach Micky Jenner briefed those in attendance about an exciting new Boat Building project the Club has embarked on - to produce a mould and Coastal Fours - built on the Island by AB Composites of Cowes - with the support of Wight Aid who were represented by Trustee Brian Marriott. The Clubs New Coastal Scull - which had been supported by Yarmouth Harbour Commission - represented by Tim Adams - was also on display in the Boathouse. This was followed by a presentation to Michael Lilley, a Trustee with the Isle of Wight Youth Trust, who - working in conjunction with Wightlink - were the Clubs nominated charity, once again in 2018. Following various fund raising activities - the club was able to hand over another cheque for £400 to the Isle of Wight Youth Trust. 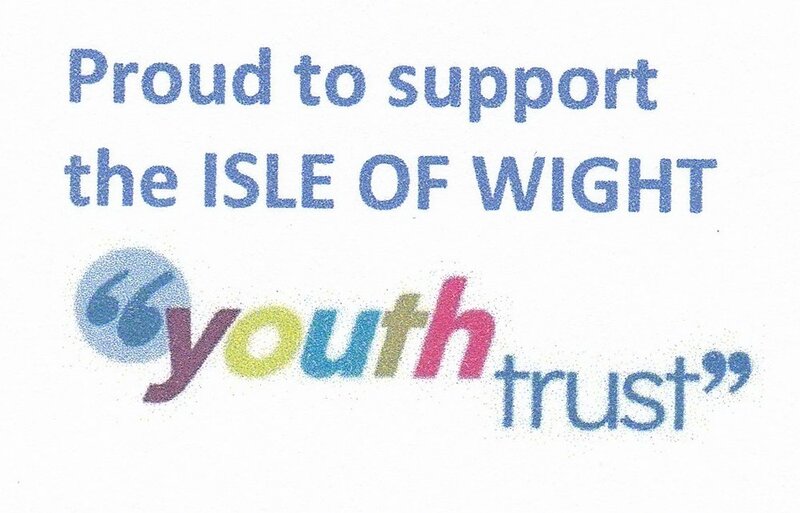 The IW Youth Trust are a charitable independent and professional organisation offering counselling, advice, information and support services to young people under 25 on the Isle of Wight and, in some cases, their parents or carers and the Club were delighted to be able to support them once again. The Ryde Solicitors Churchers, represented by Ian Heal, attended - and have supported the Club for a number of years - and Ian handed over a cheque for £1,000 to the Club towards their boat building project. Ryde Rowing Club Annual Subscriptions. Deadline for setting-up monthly Payment. Ryde Rowing Club Annual Subscriptions. Deadline for setting-up monthly Payment. Our thanks to all of you who have already paid your annual subscriptions. Bingo Night. Friday, 18th January. Around 60 members and friends attended last Fridays Bingo Night at the Clubhouse - with chief caller, Pete “whackey” calling among the hi-lights of an enjoyable evening. Pete - resplendent in his new red jacket - was ably assisted by Josie - with Steve Dear and Joel manning the busy bar. In addition to the Bar take the event raised £100 for Club funds and through the Raffle £65 for the Clubs nominated charity for 2019 - the Isle of Wight Youth Trust.